This recipe comes from one of our very creative friends, and all around good cooks! Thank you Karen, and Happy Halloween! cream butter and sugar, add egg yolk and orange peel. Roll pieces of dough into fingers. Dip one side into small amount of granulated sugar, and place sugar side up on greased cookie sheet. 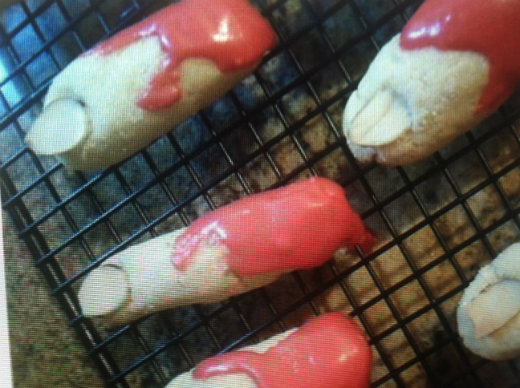 Dip one slivered almond in egg white, and stick on finger like a nail. Bake in pre heated 350 degree oven for 10-15 minutes. 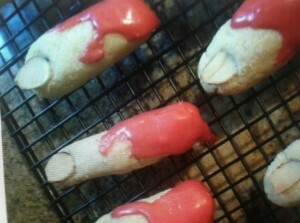 Coll, and dip end of finger in red icing. Enjoy!